A little bling is definitely needed on a gray and rainy day. This week really needs a little sunshine. 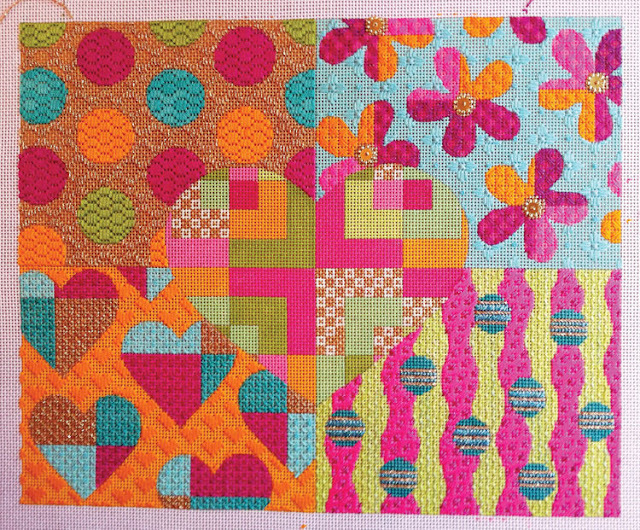 Today is the third lesson of the EyeCandy mystery Garden Party Heart Mod Collage. 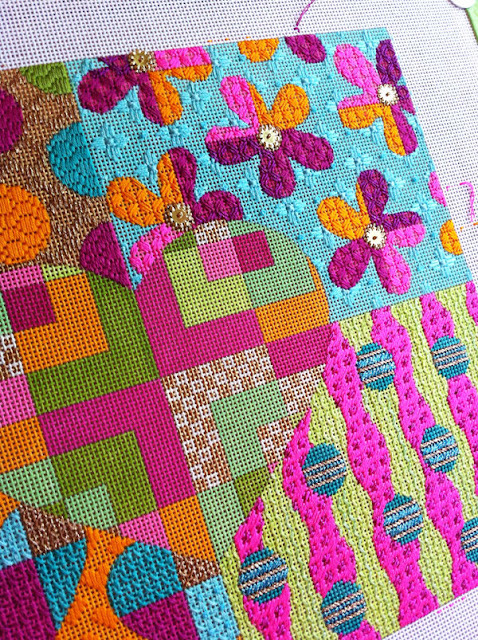 The background squares are now finished…. or are they? hmmmm. The flowers in the top right corner are poppy in bright shades of silk with fabulous gear-like washers in the center. They needed a little bling. 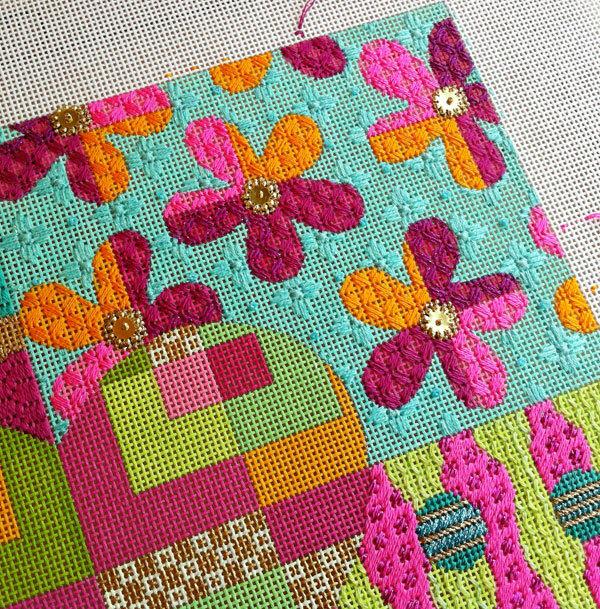 The colors themselves are so blingy you hardly notice there isn’t a bead on here yet. The bottom right corner is filled with movement and sparkle. Rainbow Gallery came out with a new color of Silk Lamé Braid just in time for this canvas. Do you think they know me? I would have preferred the smaller size but this will have to do. Here’s the entire right side completing the frame for the center heart. What shall we do with that? Next lesson is not for 3 weeks so we can all get caught up. Hope you are enjoying this easy breezy summer mystery. See you soon. « Previous Mystery Post: The fun is just beginning! Looks like you're having a great time with this piece! You are going to make me wait THREE WHOLE WEEKS to find out what happens next?!?! This is like the serial mystery where the next chapter is pre-empted by the Super Bowl and you grind your teeth…. This is so beautiful!! 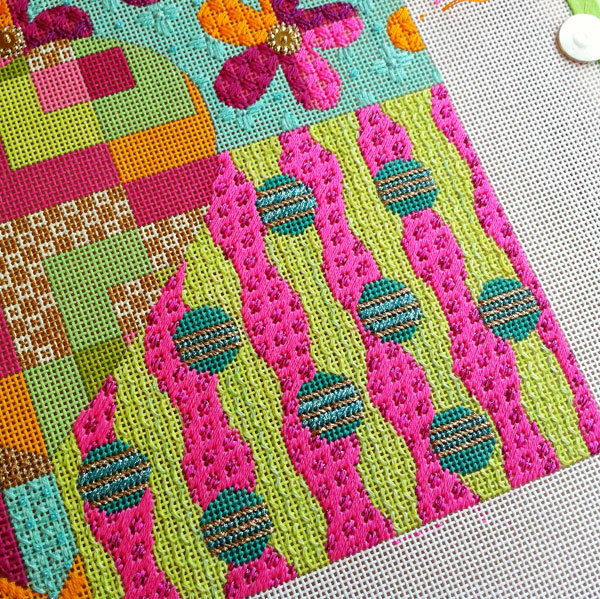 I am only on my second needlepoint project, and this gives me something to work up to!